It doesn’t get much more indulgent then some delicious chocolate, so if you really feel like treating you and the girls on your hen party this tasty and unique Choctail Making hen do in London might be right up your street! Positioned on the outskirts of London, this chocolatey London hen party activity is bound to create a memorable day for your celebrations, and will get everyone involved in learning, creating and of course tasting all different types of chocolates and choctails. Arrive in the afternoon of your hen party day to be introduced to the expert chocolatier who will lead the whole session and show you some tips and tricks of the trade. 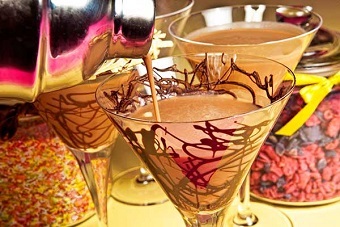 Once everyone is settled in and ready to get started, the session will kick off on a high as your whole hen group will get the opportunity to mix your very own chocolate martini, tasting along the way till you get the flavour just right for you. The choctails will include your favourite chocolatey flavours in a chocolate decorated glass, perfect for any total chocolate lovers! As well as the choctails, your 90-minute session also includes a lesson in chocolate making, and all the girls will get time to create and eat around 15 individual handmade chocolates, both plain and flavoured. If you aren’t full of chocolatey goodness by then, you’ll also learn and try your hand at piping fresh cream truffles and decorate them with a range of tasty flavours – so be creative! Throughout your hen party experience, there will be special treats for the whole hen group as well as a special surprise for the bride to be, making sure their hen do is one to remember. If you can’t quite manage all of the treats you make and receive on the day, simply wrap them up in a ribbon tied goody bag and save for another time or even give as a gift, it’s totally up to you. Everything you need is included with this Choctail Making activity, making it the perfect way to celebrate with nearly no organisation or planning. If your bride to be is chocolate crazy and looking for something unique, treat the whole hen group to this indulgent afternoon in the beautiful city of London. If you want any more information about this Choctail Making Hen Party in London, or simple want the whole experience organised for you, don’t hesitate to give us a call on 0161 341 0052 and our events planners will be happy to help.